Associated Press Jeff Williams, Apple's chief operating officer, speaks about the Apple Watch Series 4 at the Steve Jobs Theater during an event to announce new Apple products Wednesday in Cupertino, Calif.
CUPERTINO, Calif. – Apple is trying to turn its smartwatch from a niche gadget into a lifeline to better health by slowly evolving it into a medical device. Since the Apple Watch launched in April 2015, most people haven't figured out why they need to buy one. Apple doesn't release sales figures, but estimates from two analysts suggest the company shipped roughly 18 million watches in 2017. Apple sold almost 12 times as many iPhones – 216 million – last year. Apple CEO Tim Cook has long emphasized the watch's health and fitness-tracking capabilities. The original version featured a heart-rate sensor that fed data into fitness and workout apps so they could suggest new goals and offer digital “rewards” for fitness accomplishments. In February, the company announced that the watch would track skiing and snowboarding runs, including data on speed and vertical descent. 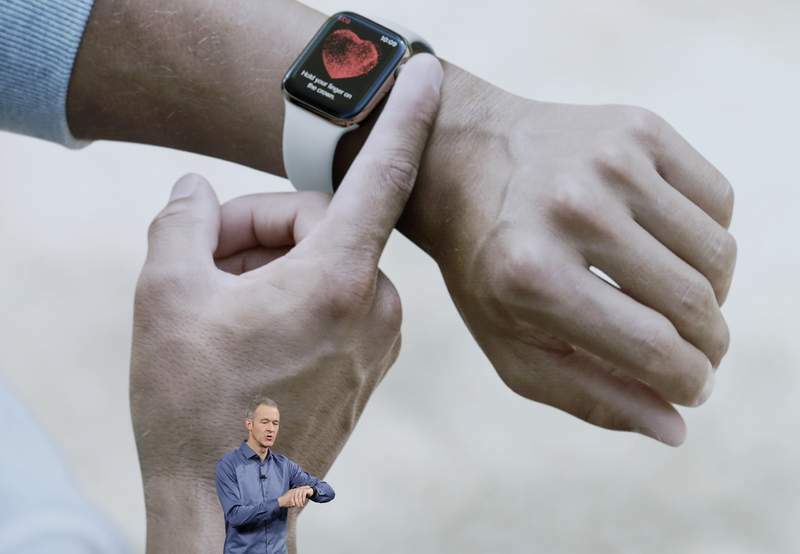 The latest version, unveiled Wednesday, is pushing the health envelope even further – in particular by taking electrocardiograms, or EKGs, a feature given clearance by the U.S. Food and Drug Administration, Apple said. The watch will also monitor for irregular heartbeats and can detect when the wearer has fallen, the company said. EKGs are important tests of heart health and typically require a visit to the doctor. The feature gained an onstage endorsement from Ivor Benjamin, a cardiologist who is president of the American Heart Association. He said such real-time data would change the way doctors work.